In certain parts of the world, Mother Nature reigns supreme. Places where the land was formed by explosions deep within the earth and shaped by the scrape of glaciers and the shake of earthquakes. Places where weather forecasts are only valid for 15 minutes; where miles and miles of land are uninhabited; and where ignoring Mother Nature can lead to serious disaster. Iceland is one of these places. The Land of Fire and Ice is beautiful and its people friendly. But this volcanic island in the Atlantic can be quite sinister, too. Winter hurricanes blow out of nowhere. Strong currents make beautiful black sand beaches deadly. Volcanoes that are long overdue to erupt rumble gently. Mother Nature reigns supreme. This is important to remember when traveling in Iceland – especially when traveling in Iceland in winter, when the weather can literally change in an instant and even the best-laid plans can be thwarted. 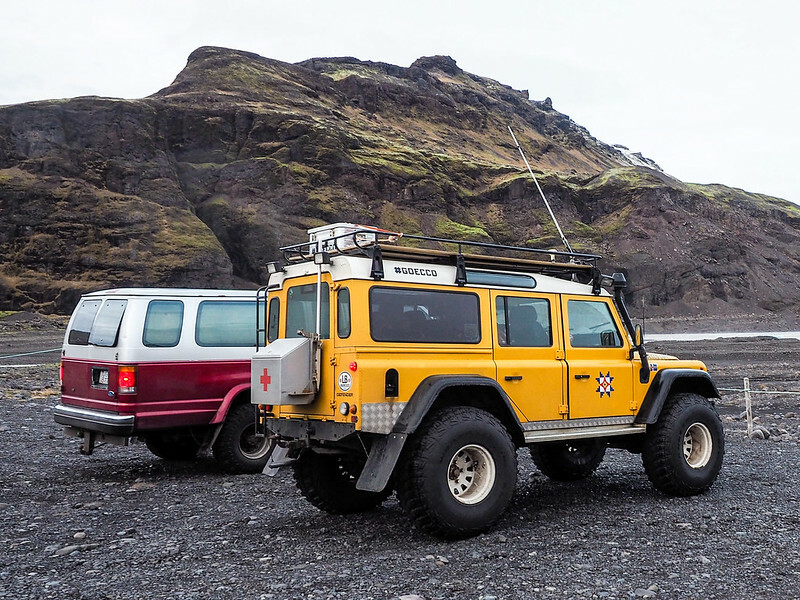 Day 1 of our “Chasing Ice” started out great – we were picked up on time in Reykjavik by Jonas in his bright yellow, tricked-out Land Rover Defender, and then met up with the rest of our tour group in a beefy Ford van. We hit the road before the sun was fully up, bound for waterfalls, glaciers, black beaches, and ice caves. But as soon as we left the city, things began to go wrong. The van got a flat tire an hour outside of Reykjavik, which caused a detour to get it fixed and then to pick up more extra tires – just in case. Then Jonas told us that a hurricane-like storm was about to pound the south coast and that we might not be able to make it to our accommodation that night. Travel enough in countries like Iceland, and you learn that you sometimes just have to go with the flow – especially when Mother Nature is involved. Going with the flow in this case ended up working out well. Without having to rush to cross an Icelandic desert before dinnertime, we got to spend some extra time exploring the waterfalls and black sand beaches that make Iceland's south shore so famous. 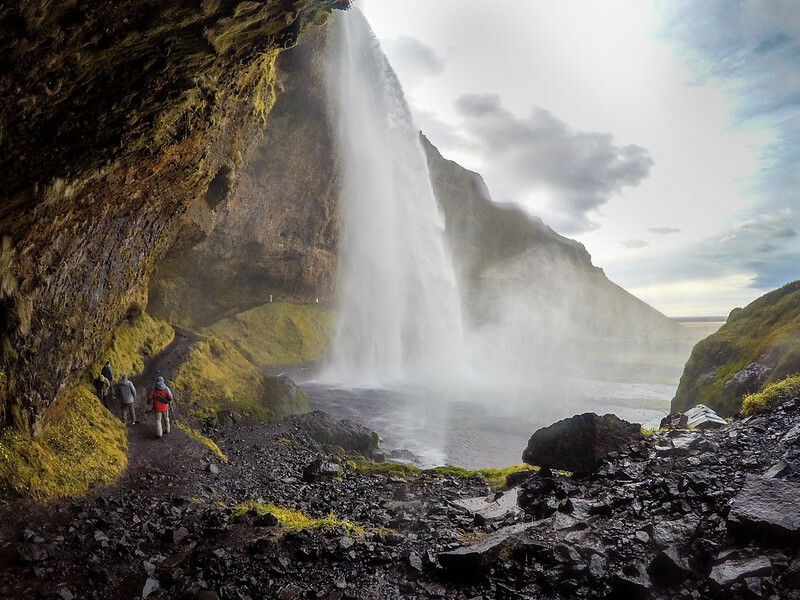 We saw the “hidden” waterfall Gljúfrabúi, braved some icy steps to walk behind Seljalandsfoss, and stopped at the thundering Skogafoss all before a lunch. Even though the wind was blowing hard enough to impede walking by that point, we also stopped at Reynisfjara Beach to see its famous basalt columns, and at the plane crash on Sólheimasandur beach before dusk. Along with getting in more sightseeing, spending more time on the road meant that we got to know our head guide, Jonas, a lot better, too. There were three of us a guide-in-training in the Land Rover with Jonas, and I got the coveted front seat on the first day. Jonas, a native Icelander who spent a large chunk of his life in Denmark, is a character, to say the least. He is blunt and honest and swears like a sailor. He's not afraid to speak his mind on things like the changing face of tourism in Iceland, or the effects of climate change, which is causing Iceland's glaciers to retreat at an alarming rate. He's also a realist when it comes to Mother Nature and Iceland. A few years back, he bought a 40-foot boat and keeps it at the ready outside of Reykjavik – you know, just in case the “big one” goes off and he has to flee the island. It's not actually all that crazy, either – volcanoes like Hekla (nicknamed “Gateway to Hell” in the Middle Ages) and Katla (“The Beast”) are both overdue for violent eruptions. And then there's Laki, which last erupted in 1783. That eruption killed a quarter of Iceland's people, and caused Europe to go “dark” for months – in fact, many Icelanders will tell you that the chain reaction caused by Laki eventually led to the beginning of the French Revolution. As we rode past Eyjafjallajokull – the volcano that erupted and famously wreaked havoc on air travel back in 2010 – I shuddered involuntarily as the true potential of what lies under the surface in Iceland hit me. We thankfully didn't run into any volcanic eruptions on our tour – but we did run into plenty of twists thrown at us by Mother Nature. That night, Jonas and his crew deftly arranged lodging and a meal for us on the fly in the middle of nowhere in Iceland's off-season. I was impressed. Normally on this tour, you stay overnight at an old converted school house where everyone pitches in to cook a homemade meal and get to know each other. But because of the high winds keeping us from the school house, we ended up eating arctic char at an IcelandAir hotel, and sleeping in some cute cabins in the middle of nowhere. If only Mother Nature had thought to throw in clear skies for a viewing of the Northern Lights! Day 2 of our “Chasing Ice” tour was where ice finally came into the picture. We started the day off at Jokulsarlon, the glacial lagoon where chunks of Iceland's massive Vatnajökull glacier break off and eventually float out to sea. The lagoon had SO much ice in it – massive icebergs in varying shades of blue and white. We had a little over an hour to explore the lagoon and nearby black sand beach while Jonas and crew went to pick up the gear we would need later for glacier hiking and ice caving. Mother Nature would thwart us at least once more, though. Our first try at an ice cave beneath Iceland's largest ice cap ended in a dead end and a flooded blue-ice cave. Thankfully, though, our second try was more successful. We strapped on ice grippers, helmets, and head lamps and descended into a pitch-black ice cave. The cave was extra dark because of the black sand/ash that had been blown across the glacier the night before, but I think that made it even cooler. Jonas then decided to show Mother Nature what his Defender and tricked-out Ford Econoline van could do, and took us on a drive atop the glacier. We stopped for a short hike across the glacier and down into the remains of a collapsed ice cave. It kind of felt like exploring the moon (you know, if the moon were made of ice). If one thing was hit home for me on this tour with Goecco, it's that you can never truly make plans when Mother Nature is involved. And, in Iceland, she is ALWAYS involved. Overall, though, I was super impressed by the entire Goecco team AND the rest of the people in our group for doing such a fantastic job of rolling with the punches and making our tour as great as it possibly could be. If you want to go on a slightly wild adventure and get up close with ice in all its forms, this is the tour for you. WHAT: Goecco, a great tour company specializing in small-group adventure tours. Check out the that we did, their , or check out their . WHEN: Ice cave tours generally run from November through April. HOW MUCH: The 2-day tour starts at $790 USD per person. WHAT'S INCLUDED: Transport and guides, overnight accommodation, dinner, and a guided glacier walk/ice cave adventure (if conditions allow). WHAT TO PACK: Good hiking shoes and waterproof layers – check out a complete packing list here. Has Mother Nature ever impacted YOUR travels in an extreme way? Big thanks to for hosting us on this tour. But, as always, all opinions are 100% my own! Incredible. Jaw-dropping. Iceland is such a fascinating and baffling landscape, and what a cool way to see the country with a tour like that. Iceland might just need to happen for me this year. 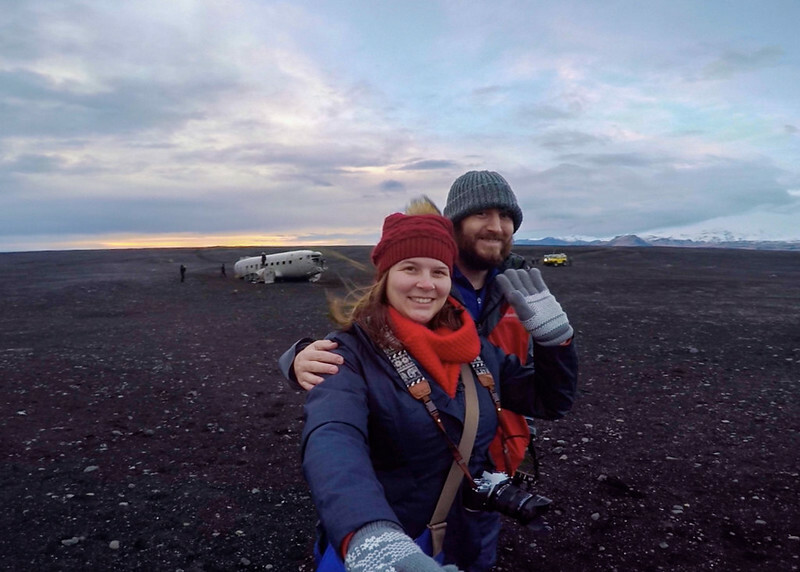 Every time you’ve traveled Iceland has it been with a tour company that takes you around? So far I’ve only traveled to Iceland in the winter – and once on my own. I didn’t feel comfortable renting a car in winter, so, yes, I’ve mostly just done day trips/tours from Reykjavik. There are SO many companies to pick from. My first time there I did just half-day and day tours. This second trip, though, we did two overnight tours, which were really good and allowed you more time to see/do things. I’m so looking forward to going there this summer. 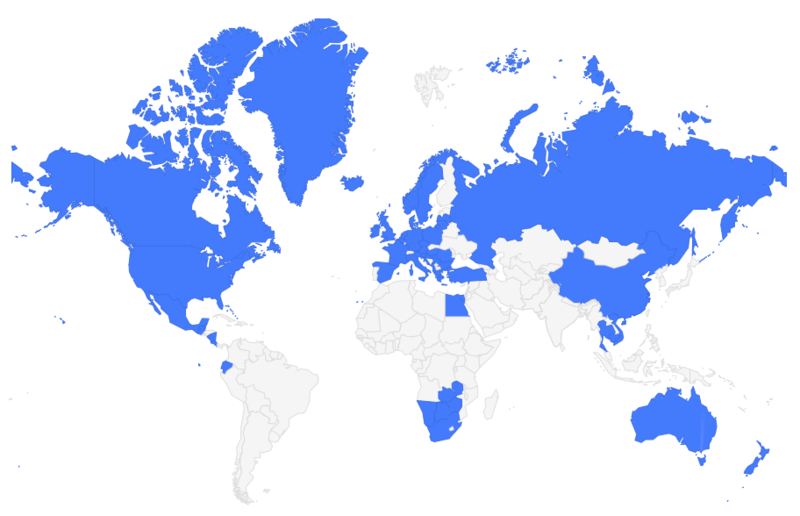 And I guess Iceland got a bit of the same as you would get in Africa. After a few trips to Africa you learn AWA – Africa Wins Again. It really is! Definitely one of the most wildly beautiful places I’ve been! Amazing photos! Hoping to go back to Iceland in August! What camera do you use? Photos are stunning! August would be a great time to go! Next time I may try September or October. I’m currently shooting with an Olympus OM-D E-M5 Mark II with a 12-40mm Pro lens. Great camera! Thanks! Iceland certainly is a place to inspire the imagination. I don’t think it’s easy to travel around Iceland without a 4X4, and about the flat tire, I think that the volcanic rocks in Iceland are quite sharp, that’s probably why you got a puncture or a cut on the tire. And about those volcanos, there was a volcano that errupted like two or three years ago and it put a hold on air traffic in Europe. What is one of those bigger volcanos would errupt soon ? I can only imagine the chaos. Not to mention the problems that the icelandic people would face. Until then, we must enjoy these changing views as much as we can. If you want to go off the main roads in Iceland, you definitely need a 4×4, yes! And yes, it’s scary to think what will happen if one of the “big ones” erupts in Iceland anytime soon… Hopefully it holds off for many more years! Alright, so when you’re in Iceland, do you actually get to learn the pronunciation of all these places, or are stuck awkwardly trying to sound them out like the rest of us??? Hahaha! I definitely can’t pronounce half of those place names! Elliot tried and actually wasn’t too bad at half of them. But my tongue just can’t form those sounds! As much as I’d love to explore ice caves I am terrified of them! Anything that involves glaciers scares me, for the exact reason you mention: you never know what Icelandic Mother Nature is up to! Mother Nature certainly reigns supreme in Iceland and it’s quite lovely. But considering how unpredictable Mother Nature is, it’s certainly seems like it’s best to join a tour sometimes in the winter. The information about the tour is very helpful. Yes, I’m definitely glad we did a couple of tours – less to worry about! We ran into some girls who were driving themselves along the same route we were, but no one had told them about the hurricane-like winds that were headed our way. Thank goodness we talked to them and warned them – they could have run into serious trouble otherwise! I was waiting for this post and you definitely didn’t disappoint with your photos! Iceland keeps getting higher and higher on my list of places to visit. Gorgeous!! I can’t get enough of your photos of Iceland! Those glacier pictures are amazing! Same with the waterfall pictures, so sounds like the flat tire was indeed not such a bad thing. Beautiful! Nope, the flat tire actually ended up working out in our favor, I think! Oh wow, it’s so beautiful! Amazing photography! I hope I can make it to Iceland one day, it looks stunningly rugged. It definitely is! Wild and rugged and very cool to explore. Wow!! What incredible photos! I love the pics of the lagoon. They remind me of my trip to Antarctica. Iceland is definitely a must. It’s definitely a must! I also need to get myself to Antarctica one of these days! Your information is so helpful and I love your website. Being a native Ohioian who loves to explore I am looking at visiting Iceland in November 2017 or March 2018. I know you can never predict weather but trying to consider the odds and determine which time has the best potential for activities as we’d also like to do the crystal ice caves and essentially the tour you outlined (and Goecco tours was a possible on the list). Wasn’t sure from your post… did you visit in January? Was there other activities you did that rose to the top of must do? thanks. We actually did this tour in November! This was in 2015, and winter was actually late coming to Iceland, meaning that the ice caves weren’t fully formed yet – the biggest one was still full of water and we couldn’t go inside. 🙁 So March might actually be a better time to go if you want to see ice caves! I completely disagree with your review of Goecco. Completely unreliable and unprofessional company. Don’t give travelers false hopes of getting beautiful pictures much less an actual tour out of them unless you want their vacations RUINED. Sorry to hear that, Carol. I can only write about my personal experiences, and my experience with the company was great!